The saw immediately below is a relatively rare first model D20 made within a year or two of 1911 when the D20 series was first introduced. The saw is curious in that it is a panel saw with blade measuring 24" long, by 6 3/8" high at the heel. The saw is a cross cut with 9 points per inch. What makes this model unique is the handle which is different from the second and third model of D20 series. The distinguishing characteristic is the notch which is pointed out at right. Saws with this feature are very rare, and it is my estimation that because of this fact they must have been made only for a year or two around the start of production in 1911. 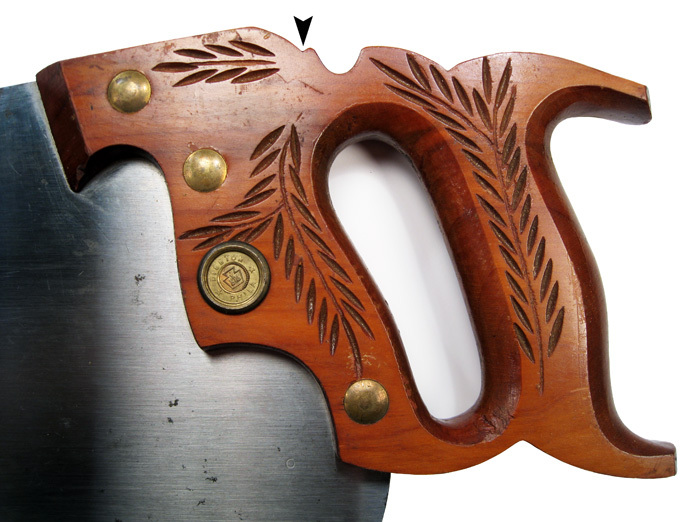 The other thing which is unique from the second model is the handle cutout is asymmetrical. As can be seen in the photo immediately below, the cutout on the second model is more elliptical in shape. 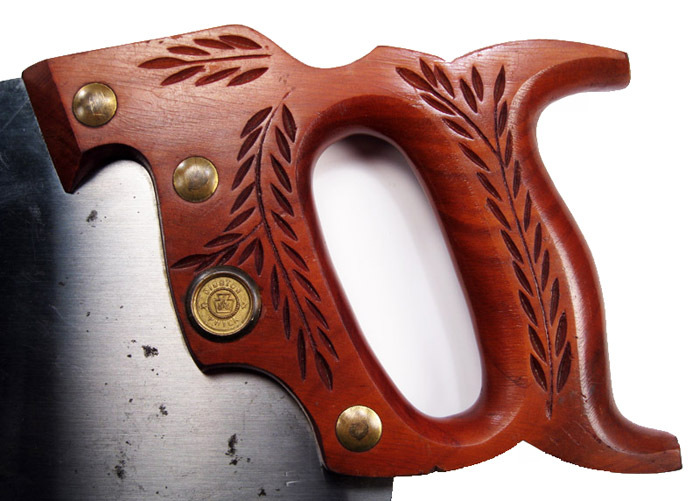 These differences are subtle, but a careful inspection can tell you if you have a first or second model D20 series handsaw. The second model D20 series handle introduced shortly after 1911. Note it is much less graceful than the first model immediately above. The etch on the first model saw is not any different than those made many years later. Having a saw which is clean enough to carefully study the etch is a rare occurrence!